The flowers in bud resemble the beak of a parrot hence the name "parrot tulips". The bright red and yellow combination creates a great impact, especially planted in large groups. Tulip 'Bright Parrot' introduces a very unqiue and special flower shape - the flowers in bud resemble the beak of a parrot hence the name 'parrot tulips'. When open, its petals curl in all directions creating a real eye-catching, explosion of fiery colour. The bright red and yellow combination has great impact, especially when planted in large groups of at least 10-15 bulbs in borders. 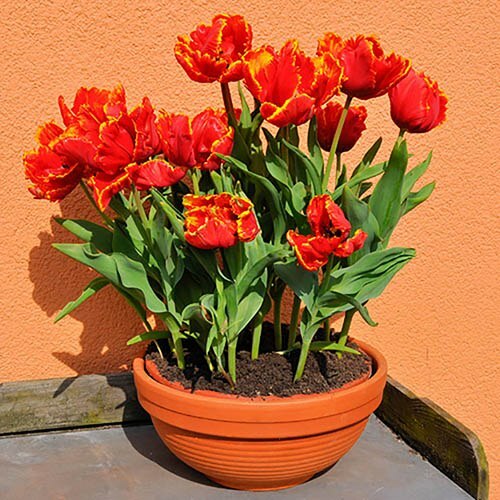 One of the most popular bulbs, tulips are easy to plant, easy to grow and easy to care for - just try to plant in a sheltered spot so the wind doesn't damage their tall stems. They are also very versatile and can be planted in beds and borders as well as pots and containers - they're great when used as a contrast against other late spring flowering bulbs. Plant in the autumn for sensational spring displays!